Diamond hoop earrings, 1.80 carats average H VS2. Diamond hoop earrings, 1.80 carats. Outside diameter is 20 mm. This is a 20mm hoop but all covered with diamonds! !1.80carat total!.Outside diameter is 20mm. 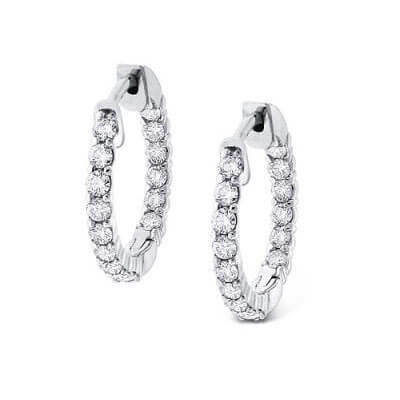 "... this was my second purchase from Diamonds USA" - Sophia J. Palm Springs,CA"
Diamond hoop earrings, 1.80 carats. Outside diameter is 20 mm.